Growing up, we went to Charleston, SC quite a bit. My mom's parents lived there, and of course there was the beach. However, since I've been an adult and my grandparents moved to my hometown, I haven't had much occasion to go onto the peninsula. This weekend, however, I decided I'd make a trip to visit one of the coolest people I know, my friend Leah. While I'd been to Charleston many, many times, I've never been there to visit an adult friend and see the things they like most. So, this was a pretty cool trip. 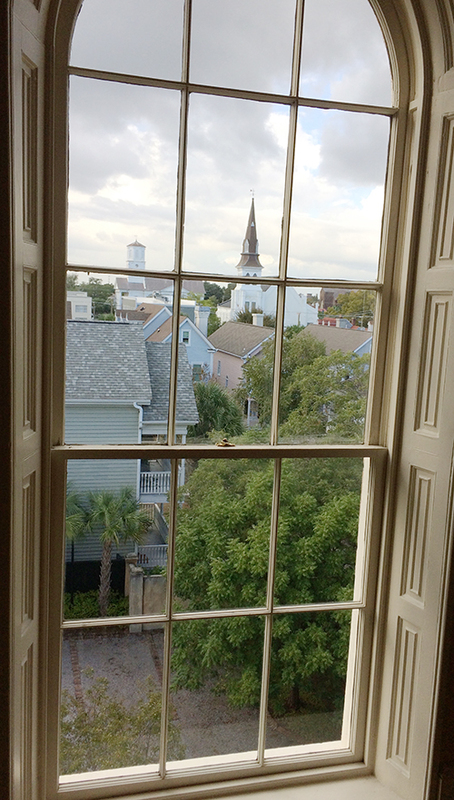 The first picture you'll see here is a view from inside a historic mansion in downtown Charleston. 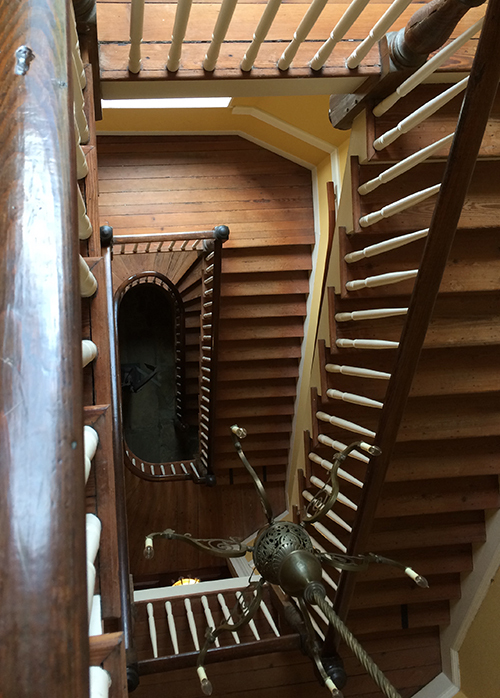 This is actually a window that's on a landing of the staircase shown below. The rest of the details in the building were absolutely stunning, too. There was so much architectural detail, and the historic paint colors are surprisingly vibrant. Additionally, the doors to the bathrooms were camouflaged to look like part of the walls, and I loved that. In short, I'm ready to movies any time now. On Saturday morning, Leah took me to Black Tap Coffee, where they have an amazingly (and surprisingly) delicious Lavender Latte. I also bought two bars of Sweeteeth chocolate. The blue wrapper one, filled with Chocolate, was by far the best. 100% would go again. 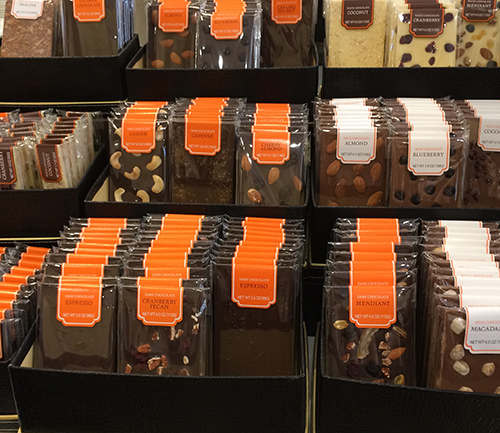 Speaking of Chocolate, upon the suggestion of a woman in a jewelry store I visited, Leah and I stopped by an amazing chocolate shop called Christophe. It's a tiny little store about half a block off King Street, and they have hand crafted chocolates, hand painted truffles, croissants, macarons, and even chocolate coffee drinks. I didn't get coffee, but I did get three little truffles: One raspberry dark chocolate, one milk chocolate with sea salt caramel, and one filled with peanut butter. I think my favorite was the heart-shaped raspberry one. You can see it above. Just imagine opening a box of those beautiful jewel-like chocolates for your birthday or Valentine's Day or just as a congratulatory gift, tied with a big, fat, fluffy bow. Perfection. As is, of course, obligatory, I did do a bit of shopping along King Street and Charleston Market. It looks as though they've renovated some of Charleston Market, and it's now apparently open at night with some live music. For all I know, this has been going on for a long time, but it was the first time I'd seen it. I didn't take any photos while shopping except at this one store, Moon and Lola. 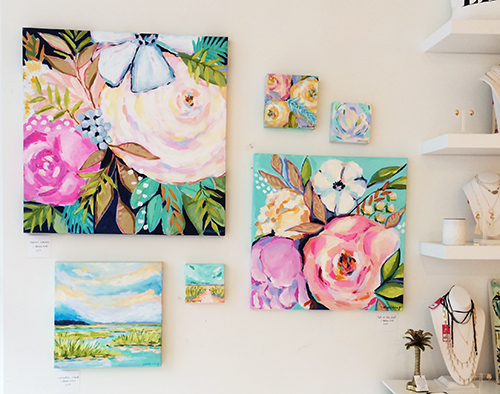 The color scheme and decor of the store was adorable, and I especially loved this grouping of paintings on the wall right when I entered, by Greenville, SC-based artist C. Brooke Ring. Whoever did the wall decor in that store should come to my apartment and help me out. All right! That's a wrap for today! Happy Tuesday!